This website is dedicated to a magical potion from the Amazon basin which is known as ayahuasca. Here you can find information on the different ingredients that are used to make this brew, the way it’s used by indigenous people, and what you can expect when you take it yourself. Traditionally this beverage contains a combination of the Banisteriopsis caapi vine and the leaves of the Psychotria viridis (or alternatively the Diplopterys cabrerana). It has now been determined what the active components of these ingredients are, and some people have used plants from other parts of the world to make similar herbal potions. You can read about this in the botany and chemistry pages. We invite you to explore this site, read the interviews and prepare yourself well before you decide to try this powerful potion yourself. In case you are completely new to ayahuasca, we recommend you start by reading the introduction. In many countries, both healers, ceremonial leaders and users of these plants are facing legal issues. The Ayahuasca Defense Fund was founded in 2015 to offer both givers and receivers of sacred plants legal defense against arrest and prosecution. 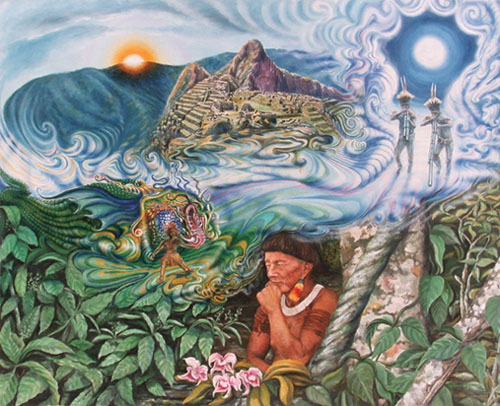 To read previous news articles on ayahuasca go to the news page. To read this and other reports, visit our experience section. We would like to expand our experience database. For this we need your help! Please share your ayahuasca experience(s) by writing a report. Contact us here. Thanks!